We can’t always have fresh herbs at our fingertips all year long. Sometimes, we have to rely on dried herbs. But how can we be assured we are getting the best flavor from those herbs? 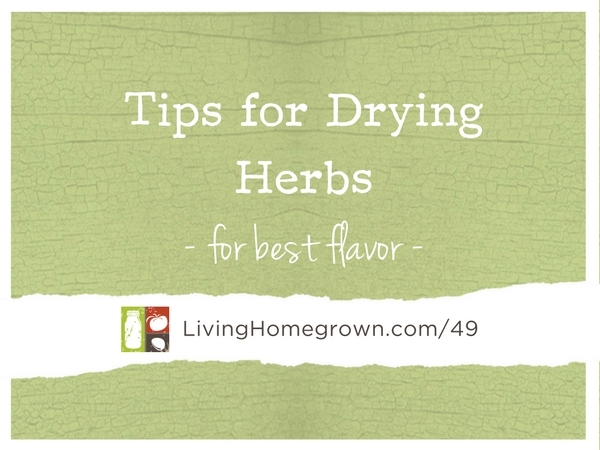 In this episode, I answer a listener question about how to dry herbs and offer tips for getting peak flavor from those herbs. First, it helps to understand the importance of essential oils when it comes to flavor. Essential oils are what give herbs their distinct fragrance. And since fragrance is also tied to flavor, essential oils are an important component to giving herbs their “zing” of flavor. But essential oils are also very volatile – which just means they dissipate easily. Some herbs hold on to their oils very well – even when dried. (i.e. rosemary, sage, thyme). If you want to dry herbs for culinary uses, always try to do it in a way that gives you the highest amount of essential oils. None of the tips below are hard fast rules. In fact, some are impractical during some times of the year. But when possible, it helps to harvest and dry herbs when the essential oils are at their peak. Doing so will just give you the best possible flavor for the longest time in storage. Many of the tips below are for when you are growing herbs yourself. But remember, you can still bundle and dry herbs you buy at the farmer’s market. Just follow the same steps at #4 and beyond. You should clip (and use) your herbs during the growing season. But the oils are at their peak just before a plant flowers. Timing a larger harvest at this time will reap the best flavors. But since that only happens for a few weeks during the year, this may not be practical. So don’t sweat it if you want to harvest when the plant is NOT flowering. It’s still good! You may have heard that you should harvest your herbs in the morning. This is because the essential oils are at their peak during the morning hours, before the heat of the day hits them. But honestly, you can get away with harvesting any time of the day. When harvesting a large batch of herbs, don’t cut more than 1/3 of the leaf growth. Any more than that and you may send the plant into shock. So don’t go nuts with the clippers. Ha! Remember, those leaves are necessary for photosynthesis. As you harvest your herbs, gather them into small bundles. It is best to secure the bundles with rubber bands rather than string. This is because herb stems shrink as they dry. When tied with string, the herbs tend to fall out as they dry. A rubber band will shrink with the stem and hold it securely. It’s not absolutely necessary, but hanging the herbs upside down will draw all the essential oils into the leaves. Keep the herbs hanging in a warm dust free area until they are completely dry. How long this takes depends upon the humidity in your area. You want the leaves to be as dry and crispy as cereal. Keep your herbs in a dark cupboard for best results. Heat and light can affect the essential oils we are trying so hard to preserve. The herbs are best within one year. After that, the flavor dissipates pretty quickly. Bonus Tip: The Car Dehydrator! You know how a car can heat up very quickly when left in the sun with the windows closed? Well, you can use that to your advantage! If you just have a small amount of herbs, you can use your car as a dehydrator. It works fairly quickly and makes your car smell wonderful at the same time. Place the herbs in a single layer on a cookie sheet. And place that sheet in the back of the car near the window. Park your car in the sun and depending upon the time of year, it can take anywhere from a few hours to a few days to have crispy dry herbs. The only time that this does not work well is if you live in a very humid area. Otherwise, air-drying works pretty well with very little effort. Canning Academy – Doors are Open! If you want to craft your own artisan preserves and capture the seasons in a jar, join me this spring. I’ll teach you the skills AND the reasons behind the techniques in canning, so you’ll have complete confidence with every batch you make. This way, you’ll know that the jars you pull off the shelf are safe for your family to eat. The doors are open to my Canning Academy for the Spring session until Tuesday, April 12, 2016. This is canning training at your own pace but with lifetime access. I only open the doors a few times a year. So, this will be it for a while. Canning Academy – the doors are opening until Tuesday, April 12, 2016. The car idea is so great, out of the dust and bugs thank you.